General Peter Chiarelli attends 'A Salute To Our Troops' pre-show of the Radio City Christmas Spectacular in 2008. Bob Greene says a gracious gesture can rescue an embarrassing moment. (CNN) -- Graciousness can pay priceless dividends. 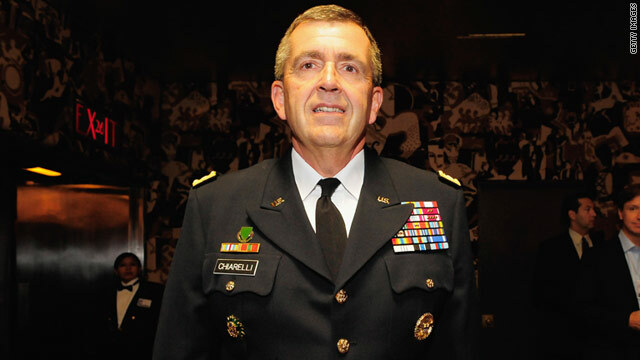 As reported by the website Daily Caller, Jarrett, a longtime Chicago friend of President Obama, was seated at the dinner when a general -- later identified as Chiarelli, the No. 2-ranking general in the U.S. Army hierarchy, who was also a guest at the gathering -- walked behind her. Chiarelli was in full dress uniform. Jarrett, apparently only seeing Chiarelli's striped uniform pants, thought that he was a waiter. She asked him to get her a glass of wine. She was said to be mortified as soon as she realized her mistake, and who wouldn't be? But the instructive part of this tale is what Chiarelli did next. "It was an honest mistake that ANYONE could have made. She was sitting, I was standing and walking behind her and all she saw were the two stripes on my pants which were almost identical to the waiters' pants -- REALLY. She apologized and will come to the house for dinner if a date can be worked out in March." Now, even if you've never met Chiarelli or followed him in the news, you have to be impressed with him after hearing that story. With his lofty rank in the military, he could have given Jarrett the deep freeze, reproached her and corrected her. But he poured her the wine -- "It was only good fun," he wrote to Starr -- and invited her to a meal at his home. He came out of the incident as a decent and magnanimous person. It's easy to do, if you care about other people's feelings. Sportswriters who covered the National Basketball Association in the late 1980s and 1990s like to tell a story about Karl Malone, the great forward for the Utah Jazz. It seems that one day in the baggage-claim area of the Salt Lake City airport, a woman was trying to lift her bags from the carousel and, seeing Malone, who was there to pick up his brother from an arriving flight, mistook him for a skycap. She asked him to carry her bags to her car. Malone was a wealthy and world-famous athlete at the time. He could so easily have hurt the woman's feelings, rebuked her. But what did he do? According to longtime Salt Lake Tribune sports reporter Steve Luhm, who covered the incident at the time and who confirmed it to me last week, Malone carried the woman's bags all the way to her car. Only when she reached for her purse to give him a tip did he in a friendly manner introduce himself and decline the offer. One of the most indelible stories about a person going out of his way to avoid humiliating another person was told in Gay Talese's 1966 Esquire article "Frank Sinatra Has a Cold," widely considered to be perhaps the finest magazine profile ever written. In the article, Talese described a party at the home of Sinatra's former wife, at which Sinatra, who maintained cordial relations with her, was acting as host. A young woman at the party, according to Talese, "while leaning against a table, accidentally with her elbow knocked over one of a pair of alabaster birds to the floor, smashing it to pieces." Talese wrote that Sinatra's daughter Nancy, also a guest at the party, started to say: "Oh, that was one of my mother's favorite..."
"[B]ut before she could complete the sentence, Sinatra glared at her, cutting her off, and while 40 other guests in the room all stared in silence, Sinatra walked over, quickly with his finger flicked the other alabaster bird off the table, smashing it to pieces, and then put an arm gently around [the young woman] and said, in a way that put her completely at ease, 'That's OK, kid.' "
It can work the other way, too, and can be remembered just as long. I was once working on a profile of a famous singer, also for Esquire, and one evening we rode in his limousine to a concert hall. As he walked backstage he was stopped by a young, nervous and inexperienced usher with a clipboard who had been assigned to make certain everyone in the area was authorized. The usher asked the famous singer if he was the comedian who would open the show. The singer did not speak to the young usher or make eye contact with him, but instead walked immediately over to a person in the management of the auditorium and demanded that the usher be dismissed. The singer, in trying to make the young man who had made a mistake feel small, had only managed to make himself seem tiny. What Gen. Chiarelli did, though -- like Karl Malone, like Frank Sinatra -- was to demonstrate, instinctively and in an instant, what it means to be a big person. The rest of us may never reach the exalted status of those three men. But kindness knows no social stratum. Every day, we're given the choice. Consideration? It's free of charge. It can echo forever.